Krabi, located on southern Thailand’s west coast is a rugged and relaxing destination. With beautiful white beaches, lush jungle and cliffs. It’s the perfect place to explore, get active and discover the beauty and nature of Thailand. Your days may include basking on Railay Beach, taking a dip at the Klong Thom Hot Springs or walking the streets of Krabi Town. From city to beach to jungle. Krabi is a varied location, with much to do and much to tire you out. 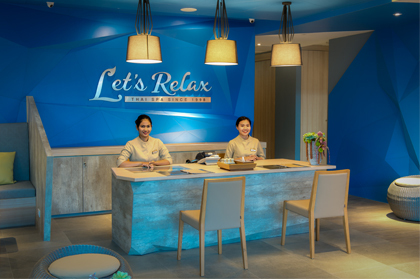 Choose from one of our two locations, our first is the Let’s Relax Holiday Inn Resort, a beautiful beachfront location on Ao Nang beach and the second located in the town centre, Let’s Relax Krabi Tipa Resort. With these two convenient locations, you can enjoy a massage in Krabi wherever you land – whether on the beach or in town. We have a variety of different massage treatments available at our spas in Krabi, and something to suit everyone. Such as the popular Thai Massage, which is an ancient healing system that combines acupressure, Indian Ayurvedic principles, and assisted yoga postures. Thai Massage at our massage spa in Krabi follows the energy lines of the body and will leave you feeling limber and relaxed after a day exploring the town. With extensive choices, your massage in Krabi will be perfectly suited to your requirements. Choose to add aroma oil to your massage in Krabi and you’ll take your relaxation to the next level with one of our carefully selected scents. As well as Thai and Aroma Oil Massages, we have a full range of skin treatments and packages at our Krabi spas. Enjoy a massage for yourself or a full day package with a partner or friend. Inclusive of treatments like facials, body scrubs and baths, it’s the ultimate serene experience to leave you refreshed, and recharged. Our Krabi massages are designed to be the perfect start or end of your busy day. Let’s Relax Krabi Tipa Resort Aonang “Coral Karst” is a day spa in the shoreline town, Krabi. Conveniently located on the main street of Krabi town center, This branch’s design derived from the dreamily Krabi’s trademark karst formations curving along the coast with signature Rock Climbing cliffs as the highlight. Blending in the gray of the Rocks with the Turquoise of seawater, it makes the perfect spot for the perfect getaway.